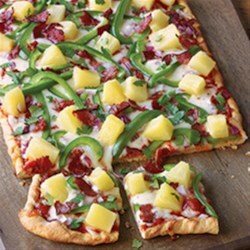 "Crumbled bacon, pineapple chunks, bell pepper strips and prepared pizza sauce make a quick and tasty pizza." Preheat oven to 400 degrees F. Spray a large baking sheet with non-stick cooking spray. Press dough into a 15x10-inch rectangle, and decoratively pinch the edges, if desired. Bake 8 to 10 minutes or until edges begin to turn light golden brown. Meanwhile, cook bacon or deli ham until crisp in a non-stick skillet over medium-high heat; crumble and set aside. Spread pizza sauce evenly over crust. Sprinkle with cheese and remaining toppings. Bake 10 to 15 minutes or until cheese is melted and crust is golden brown. See how to make the world’s most patriotic pepperoni pizza. VARIATIONS: To prepare a variety of pizzas, choose from crust and topping options below. Bake times may vary. Goat Cheese and Arugula Pizza: Top pizza sauce with shredded mozzarella cheese, crumbled goat cheese and thinly sliced red onion before baking. After baking, sprinkle with arugula and shredded basil. Lasagna Pizza: Top pizza sauce with shredded mozzarella cheese, cooked and crumbled Italian sausage, dollops of ricotta cheese, thinly sliced red onion and grated Parmesan cheese. Four Pepper Black Bean Pizza: Top pizza sauce with shredded Mexican cheese blend, canned fire roasted diced green chilies, thinly sliced red, green and yellow bell pepper, thinly sliced red onion and rinsed and drained canned black beans.